Wedding Photography is more than just a job, it is a profession. We take pride in being able to share in one of the most intimate, important and touching moments in people’s lives. Our photographers carry the responsibility of capturing intense emotion through pictures and at the same time tell the story about the lives and people that take part in your special event. We care about you, your day, and your wedding photography. We hope we have the chance to work with you and your family, like so many other families we have served. Over the last 20 years, we have served over 7,000 New York families. We hope to work with you, to show why ADA Studios is considered a premier wedding photographer on Long Island. Come visit us and learn about the quality of our work, our commitment to making your day special, and our ability to deliver photography that captures the memory of your wedding day. We have a staff of 9 highly trained professional photographers for you to choose from, each dedicated to their craft with large portfolios. 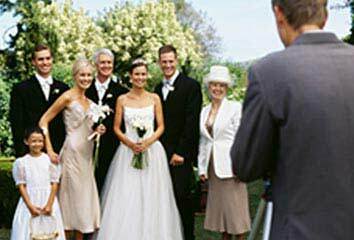 Our Wedding Packages are flexible and designed to make your decisions easier when it comes to selecting photo quantities, image sizing, frames, and album styles. Ask about our Photojournalism Style and the long legacy of photographers in our family. Congratulations on your special day. We hope to see you soon. The Selfie Photobooth by Twine Live is the Original, One and Only, and truly awesome Selfie Machine making its way around Manhattan, Long Island, New Jersey and New York. Mobile Apps for all party goers give real time access to all event photos in real time. No email, no fuss, and everybody loves it. Rent the Original OpenAir photobooth and go out for a completely branded booth and photo sharing experience. Advance Formal Wear has been helping the Rockville Centre community for over 80 years for all their formal evening wear. We are family owned and operated as well as open to the public 7 days a week. We own and tailor all garments in house so there is never an issue of “will it fit?”. Our team of tailors and men’s clothing professionals will walk you through the fitting process and provide 5 star service while answering any questions or concerns you may have during the fitting. Our team at Advance Formal Wear looks forward to helping you with your formal attire needs for your big event. After Hours Music & Entertainment is Celebrating 16 Years of Service to the Long Island – NY Metro Area! Need a Party Band or DJ for your Wedding, Bar/Bat Mitzvah, Sweet Sixteen, or any occasion? After Hours Music & Entertainment can provide you with high-energy, live music at its best, for any affair on Long Island, Brooklyn, Queens, Manhattan, Suffolk and Nassau County – as well as the NYC tri-state area including NJ and CT. Our wedding orchestra, musical ensembles, and professional DJ staff are ready to help make your reception or event special and memorable. Video Screen, Plasma, & Up Lighting Packages! After Hours Music & Entertainment is Celebrating 17 Years of Service to the Long Island – NY Metro Area! From Weddings, Bar and Bat Mitzvahs, Sweet Sixteen’s, Corporate Events to any Private Party, All Island Photo Booth has your photo booth needs covered for every occasion. From the moment you book us to the end of your event, our company will stay in contact with you and assist you with your every need. During your event, you will be assigned a fully trained on-site technician who will assist you with your photo booth needs until the events completion. All of our party packages are customizable with an assortment of optional add-ons. Contact us today for a quote. One thing I am most proud of Long Island for, is the resilience that was shown during super Storm Sandy. It was a wonderful to see everyone pull together, and support one another during a difficult time. This also taught the importance of protecting our families, and friends from life’s disasters that can come unexpectedly. For help in making sure you, and your family are protected, come swing by my office located on Sunrise Highway in Seaford Plaza by Mario’s Pizzeria. Come say hello, and see how we can help you protect you. Or also if you need something notarized, I’m a notary as well. Enjoy life now while planning for tomorrow. I will work with you over time to help you plan to achieve your financial goals based on what is truly important to you – and adapt to any changes along the way. With our exclusive Confident Retirement® approach, I provide personalized financial advice and solutions across all areas of your financial life. And if there is anyone you care about who could benefit from a second set of eyes, I would be glad to help them. For more than 120 years Ameriprise has put clients first — which is why we are rated #1 in the investment industry in customer loyalty. All of our BonBons are crafted by hand and decorated individually to create a unique chocolate eating experience. Our chocolate is made from high quality cocoa that is melt-in- your-mouth goodness! The fillings are made with real fruit, homemade caramel, and rich chocolate ganache.